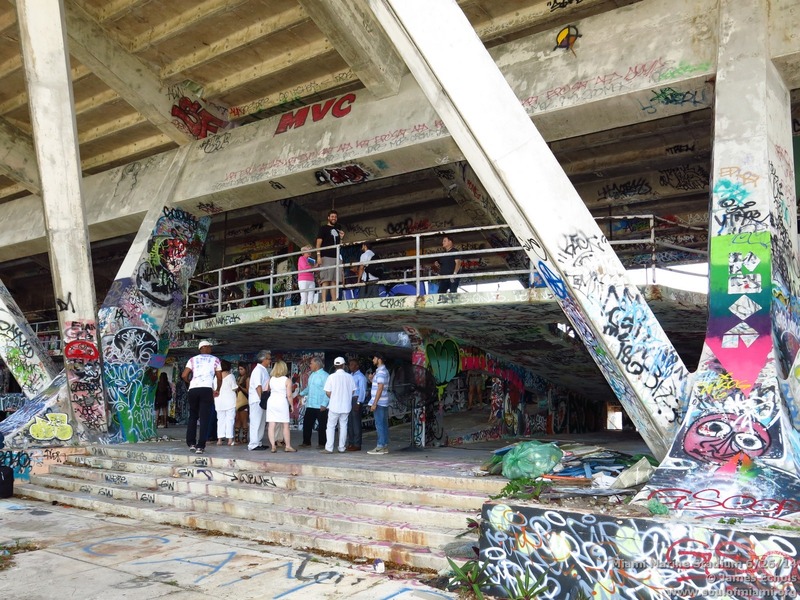 On Saturday, June 28, we were allowed to visit the Miami Marine Stadium as part of the Day of Art and Action hosted by Gloria Estefan. Did you know there is a campaign on to save and restore the stadium? Below are some hi-resolution photos of the stadium and the art there. On Saturday, June 28, international superstar and leading Miami businesswoman Gloria Estefan will kick off a daylong celebration at Miami Marine Stadium. Estefan, a Trustee of the National Trust for Historic Preservation who was named the “Voice of Miami Marine Stadium” in May 2013, will be joined by representatives from the National Trust and Friends of Miami Marine Stadium to unveil several recent, high profile accomplishments in the campaign to restore the iconic stadium, including an announcement by Estefan herself. The ART History Mural Project, for which nine world-renowned contemporary street artists will be at the stadium to create large-scale, site-specific murals. The project, curated by stencil artist and muralist Logan Hicks, features a roster of local and international street artists including Luis Berros, Doze Green, Elbow Toe, Evoca1, Ian Kualiâ€™I, Joe Iurato, RISK, and Rone. Although closed to the general public, these incredible murals will be presented through extensive documentation, as well as an archival print release at www.arthistory2014.com. Proceeds from the sale of the prints will directly support the stadiumâ€™s restoration. An exclusive Instagram contest hosted by the National Trust for Historic Preservation. Space for this exclusive contest is limited to only 30 registrants, who will be selected by the National Trust based on theirÂ enthusiasmÂ for taking photos of all the things that make Miami specialâ€”including itsÂ historic icons like Miami Marine Stadium. Contest winners will get to meet Gloria Estefan, interact with the nine artists of the ART History Mural Project, and explore the stadium with its architect, Hilario Candela. Visit www.savingplaces.org/marinestadium to register. The deadline to enter is Monday, June 23, at 5:00 p.m. EST. The June 28 event comes at an important time for the stadium. In July of 2013, Miamiâ€™s City Commissioners voted 4 to 1 to give Friends of Miami Marine Stadium full control over the stadium and the surrounding site so they could develop a plan to renovate and re-open the facility. Per an agreement with the City of Miami, Friends of Miami Marine Stadium has until January 2015 to raise an estimated $30 million to restore the stadium, with $10 million of that either identified or committed. The National Trust for Historic Preservation is a privately-funded nonprofit organization that works to save Americaâ€™s historic places. In 2012, the National Trust named Miami Marine Stadium to its growing portfolio of National Treasures â€“ historic buildings, neighborhoods, communities, and landscapes across the country that are threatened and face an uncertain future. For more information, visit www.savingplaces.org. Miami Marine Stadium has unknowingly reinvented itself as an iconic venue for street artists, who have flocked to the site from around the world to paint it. These artists, who saw Miami Marine Stadium as a muse, are responsible for breathing life back into this architectural gem. The ART History Mural Project was created to acknowledge artistsâ€™ role in the story of Miami Marine Stadium. Existing murals have already been painted by Axel Void, Hox, Pixel Pancho, Stinkfish, Abstrk, and Tatiana Suarez. Artists will continue to paint over the summer of 2014, with another group of renowned international artists coming together on September 6, 2014. The ART History Mural Project will culminate in a print show at Miamiâ€™s Gregg Sheinbaum Gallery in September, and a final art show of original works in December during Art Basel. Support for the project has been provided by Liquitex, 1xRun, Crescent Cardboard, and the National Trust. For more information and to purchase prints benefiting the stadiumâ€™s restoration, visit www.arthistory2014.com.